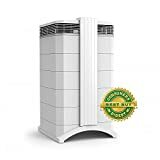 IQ Air - HealthPro Plus : Air Purifier Review • The Air Geeks, reviews of air conditioners, dehumidifiers and air purifiers. The HealthPro Plus is an exceptional air purifier that uses HyperHEPA filtration technology to clean the air in your room and ensure that it is free from airborne contaminants of all sizes. This unit is capable of trapping a wide range of potentially harmful airborne pollutants. In addition, this air purifier is designed to run quietly. If you are looking for a highly effective air purifier that is capable of eliminating all airborne contaminants from your home or office, then you should consider the HealthPro Plus. This air cleaning system is designed to deliver exceptional air cleaning performance. Considering that you could be looking for more information about this unit, we have tested it and gathered all the information that you need prior to ordering one. We will start by exploring the features of this air purifier. The HealthPro Plus is a highly effective air purifier that utilizes the HyperHEPA filtration technology. This unit captures virtually all airborne contaminants to ensure that the air in your room is free from dust, pet dander, pollen, dust mites, viruses, and allergens. This filtration technology is capable of capturing microscopic airborne particles that are as small as 0.003 microns. 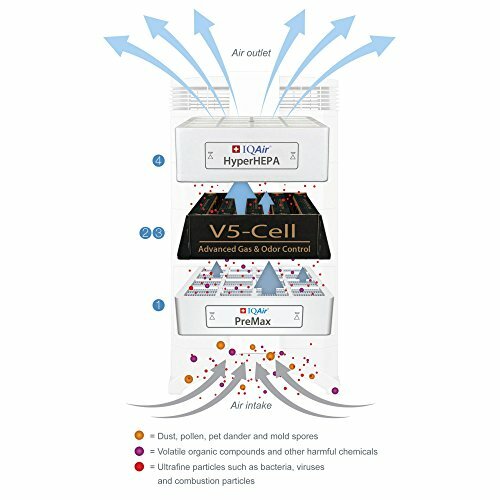 For airborne particles that are larger than 0.3 microns, the HyperHEPA filtration technology can remove up to 99.97% of the pollutants. The technology is, therefore, more effective than the standard HEPA technology. Have you been struggling to control your allergy with little or no success? The HealthPro Plus is highly effectively in eliminating allergens from the air in your room. If you or a member of your family has been experiencing allergic reactions due to high levels of dust or pollen, then this air purifier is a suitable remedy. Furthermore, this air cleaning system effectively removes airborne pollutants that can trigger asthmatic reactions. Are you looking for a quiet air cleaning unit that you can place in a quiet environment such as your child’s bedroom or office? The HealthPro Plus is optimized to run quietly. The unit is, therefore, a suitable choice for people who are highly sensitive to noise. According to the manufacturer, the HealthPro Plus is one of the quietest high-performance air purifying systems. How does the HealthPro Plus filter the air to ensure that it is completely free form airborne pollutants? Air goes through a four-stage purification process before it is released into your room. In the first cleaning stage, air passes through a pre-filter that captures pet dander, pollen, mold spores, and other large airborne particles. From the pre-filter, air passes through a layer of activated carbon granules. This layer removes volatile organic compounds from the air to ensure that it is odorless. In the next filtration stage, the air goes through a Pelletized Chemisorption process. This process destroys various harmful chemicals such as formaldehyde. Lastly, air goes through the HyperHEPA filter that removes fine and ultra-fine airborne particles. Some of the particles that are captured by this filter include combustion particles, viruses, and bacteria. The HealthPro Plus is an energy efficient unit. At the lowest speed, the unit consumes less than 20 watts. At the highest speed, the unit consumes about 135 watts. If you are looking for an air cleaning system that will not cause a spike in your electricity consumption, then you should consider this unit. This air purifier is suitable for large offices, large bedrooms, spacious living rooms, et cetera. Although this unit is highly effective in removing a wide range of airborne pollutants, we have observed that it produces a chemical smell when it is used for the first time. After testing it to establish the source of the smell, we realized that it was coming from the V5 filter. This unpleasant smell disappears after a couple of days. Highly effective. This unit effectively removes a wide range of airborne contaminants. High quality filters. Unlike most air purifiers, this unit comes with durable and high quality filters. Quiet operation. The HealthPro Plus is optimized to operate quietly. It is one of the quietest air purifiers in the market. Produces an unpleasant smell. Just like most new air purifiers, this unit produces an unpleasant chemical smell. This smell disappears after a couple of days. Relatively expensive. As compared to other units of same capacity, the HealthPro Plus is relatively expensive. I've had terrible allergies my entire life, waking up every morning sneezing constantly for hours and blowing my nose. I've tried pretty much everything with varying degrees of success. I'm highly allergic to dust mites, so an expensive bed wrap and pillow wrappers, and changing the sheets as often as I can get the energy. Leaving the windows closed to keep out allergens, leaving them open for fresh air, nasal sprays, neti pots, and of course every OTC drug there is. Some of which gave some relief, but none prevented my early morning allergies, which is always when it was the worst. I finally bit the bullet and bought the IQAir, not really expecting it to do anything. And for the first week or so it didn't, and I toyed with the idea of returning it as another failed attempt to relieve my allergies. But I figured I would try to crank it up before doing so, the machine is in my bedroom and can be a bit loud for sleeping at higher settings. But for the price, I figured I might as well try, and it worked. And I don't just mean my air was slightly fresh, I mean my allergies are gone for the first time in 30 years. I wake up with a clear nasal passage, no sneezing, no anything. It's actually kind of strange not having to blow my nose all morning. Over the past few weeks i've been playing with the setting to get it down as low as possible while still working, and the setting that works for my room is 4. It's a bit loud at this setting, but it's a tiny price to pay for drug free total allergy relief. If you have allergies I highly recommend putting this in your bedroom." I own the prior version of this air filter. The HealthPro series from IQAir has no equal. Prior to owning my last IQ Air I owned a number of competitors, which after some time all broke. They were not the cheap models, spending over $200 on most units. Typically they would last anywhere from 2-5 years then fall apart. You will not find a better air purifier, this removes the tiniest of particles, with each unit tested (you get the output). Also, for any sort of odor, the PLUS model has a 5lb active charcoal filter... and removes odors like no other. Filters last a very long time. Based on typical useage... if you run about 10 hrs a day, figure 18 mo on the pre-filter, the v-5 (active charcoal filter only on plus model) will last about 2 years, the HEPA lasts about 4ish. It is dependent on the amount of dust and small particles though, but even then I would think that you would just have to replace the pre-filter more frequently. Same goes with odors, if you have odors from lots of places you may need to replace the active charcoal filter more frequently. If I could alter one thing on the unit, it would be great if they had some way to recharge the active charcoal filter (i.e. if you heat active charcoal to 200 degrees for 30 minutes you destroy organic material in there). But you can't have it all and no one does that. My HealthPro Plus (the old model), was purchased in 2002 and has run 24x7 since then, yes 13 years with no issues. So now onto the comparison. - The new model is much quieter, I'd say that on any given speed, the new unit is as quiet as one level down. So if your old unit on 4 is fine, you can run the new unit on 5 and it will be the same noise level. - Wheels, it seems silly but the old model wheel system was horrible. They attached but didn't like to stay on. The new unit is much much better with no fall off." If you are looking for a highly effective air purifier that is capable of pulling virtually all airborne contaminants from the air in your room, then you should consider the HealthPro Plus. Its filtration mechanism makes it exceptionally powerful. On the flip side, this air purifier is relatively expensive. If you are on a tight budget, then you need to consider another option.